Are You Ready to Take Your Senior to ER? Grab n Go Ready ER Kit – Just 4 You! Thank you Cindy…don’t feel bad…I’ve been there too. You sit in that hospital and are uncomfortable…and can not just race home to change or get your things….so what I suggest is that if you are caring for a senior….YOU NEED A BAG FOR THE ER! I have heard the stories for years…a spouse, family member or dear friend goes into a serious backward spiral and you know that you have to call 911 or take them to the hospital yourself. You are caught up in the moment of panic, worry and actual action of caring for the senior. Out the door you fly…to drive behind the ambulance or drive to the emergency care place yourself. The last thing on your mind is comfort..your mind is racing and your heart is in a high state of worry. But once at the hospital…everyone starts to ask you questions…social security numbers, health card information, does the senior have allergies, what are the medications that they are taking…you stand there in stunned silence…just wanting to be in the ER with your spouse or parent…and there you are – stuck with answering questions that you are not prepared to answer. After that nasty 15-20 minutes…you try to find your senior and they have started treatments. They are telling you things and you wish you could write them down…new ideas for treatment, interactions of medications and you are just trying to breath and tell your senior that they are OK…just hang in there. Then the ER puts the senior in a side area and they have to wait…wait for tests, wait for doctors to arrive, wait for ER or CAT scans…and the minutes stretch into hours and hours…then they say they will put the senior in a room for a couple of days…they want to keep them on close watch. Close watch? That means you don’t leave your senior’s side. You are tired…your phone is on the last few minutes of energy…you have no phone numbers with you to use the hospital room line. You need to drink some water, have a snack but its the middle of the night and the cafeteria is not open yet and no change for the snack machines. You have now been at the hospital for 4-6 hours and you are looking at an over-night stay…sitting in a chair in the room. Nasty….and all of us…have gone through all of this and there is no reason to do that to ourselves….we do enough just loving and caring for our seniors. We need to be prepared for these fast, unscheduled emergencies….so we all need to put a kit together for our own use. If you have not experienced this yet, please believe me…it happens…your senior can fall or become unwell in an instant…and you will be faced with all this drama…and wind up feeling like a fool that you did not plan ahead to make the trip so much easier for your self. REMEMBER: the hospital is going to give full care to the senior in the emergency…YOU are the one that is not going to be cared for…you are simply in their way…so you stay quiet and try to stay close to your senior so you can give them calm and love. BE PREPARED! I keep an ER info Kit for George in my handbag…and one in the kitchen. I have given one to my sister and his kids know where I keep another copy. I have all the info that the ER entry office person is going to ask me. There is a good copy of all his cards, front and back. There is a review of what he is allergic to and his personal needs for check-in. There is a very detailed medical prescription and doctor listing and there is Power Of Attorney or a letter signed…that allows you to give and get medical information. I also tuck in the driving instructions so if I get too nervous or stressed…I can still get to the hospital. This is a must…and you have to take time to type it up and make copies…and then you are set to go. I update my medication listing…and you will find a whole blog on the details on April 21, 2010 called “If your senior goes to ER, are you ready” Please put that in the search bar on the top of the page and read over that blog…it has all the details for the paperwork to get you in the out of the check-in process of hospital or doctor visits. I can not tell you how many health care professionals tell me how they love my kit…you will too. Just remember this information is all of the personal ID on the senior and it has to be kept private and safe…so keep it protected...I use a plastic envelope and I also have a whole booklet that I use for his medical information. If you do put together the “Grab n Go Ready Kit” you will also have a spiral notebook n pen to take notes. Trust me…I have given care to my mum and my husband for over 10 years now…you need these items when you go to the doctor and the hospital. I know you may think they have all the patient’s information in their computer system…but you are wrong…info is rarely updated and they often lose the patient in the computer files. Be ready to give them any thing they need to help the senior get well in the middle of a crisis. Do not count on your mind…even ss# can be forgotten or mis-stated when you see someone you love in peril! (NOTE: What I remember is wasting time at the check-in window when I wanted so badly to be with my frightened 95 yr old mother in the ER room…to keep her calm. I did all of this so I would never have to repeat that.) The next time we were at the ER…the check in lady…just took my paperwork and told me she would enter it all and bring it to me in the ER…it was perfect. I have been thanked by nurses, doctors and admin-people for having the information so well-organized and it only took the time for me to enter it into the computer the first time. I update the info every six months or on medication changes. Easy -peasy for no stress check-in’s. Well this is the chair you get to live in for a couple of days. As you can see it is not pretty, but it does recline and you can stay in the senior’s room…by their side and be part of their healing team. 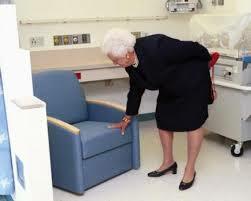 Even a First lady, does not get anything better than a sleeping chair in most hospitals. But trust me…its a lonely place if you don’t have anything with you. 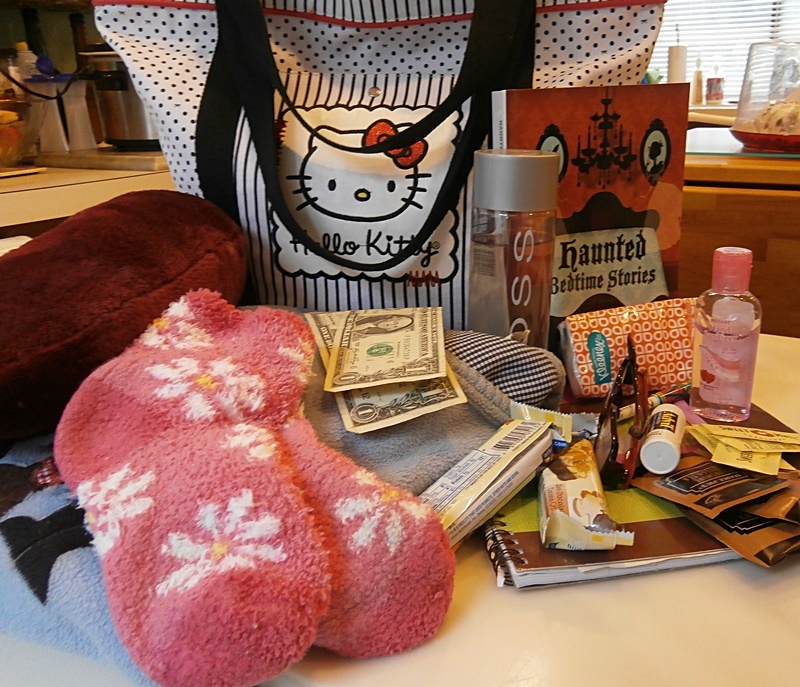 So, out comes your ER GRAB n GO READY BAG…and you have a few things to make yourself feel comforted and rest as you help your senior do the same. A small water bottle is in my bag…you can refill it in the hall with the drinking fountains. This is just a must…I don’t want to be buying soda all day…and swell up…the hospital can have dry air…so stay hydrated. I also have a couple of snack bars…to get me through. Usually the emergency is through the night and when I am able to take a few minutes to eat…the cafeteria is not open and you are faced with only snack machines. So, I have my snack bars and I tuck a few dollars in an envelope and keep in my bag. Often times, I am out of cash in my purse so this makes it easy to get anything I want out of the machines…and then I can also go to the cafeteria for a sandwich or soup during the day. I also tuck in a few tea bags and sweeteners…you can always get hot water from the nurse’s station…and it tastes so good to relax and calm yourself with tea. You can also ask them if there is a snack fridge for family….the VA has a nice area for us to go and get hot coffee, yogurt, or pudding etc – any time, when we are with our loved ones. Don’t be afraid to ask…it maybe there for you, just steps away from the room. Keep clean…wash your hands until you drop when you are in the hospital…and I have a small hand cleaner in my bag with Kleenex if I get snuffy. Plus…you will never find me wo/ my Advil. I have a bad back and I tend to get pressure headaches…so my little package of Advil that I got at the Dollar Store is heaven-sent when I’m in need. If I was taking medications…I would have a couple of ziplock baggies with a couple of days of those in my Ready Bag too. Nothing worse than going without your bladder or blood pressure med for a day or two…add in the stress and your body will really complain. Bored? Remember…people that are unwell…sleep. The hospital will give them drugs to keep them calm…but what about you? I bring a book to read. I use a Kindle but you don’t want to depend on remembering that….as you run out the door. A good old fashion paperback book and a pair of readers can be tucked in and ready for you to dive into and remove your stress in a good story. An older Mp3 player is also a great tuck in…yes, TV’s are in the rooms…but often they are on a channel that you don’t like or you can not hear them…so I make sure I have my own things to keep me calm. If you are a knitter…just tuck in an old project you have never finished…in a zip lock bag and its there for you. Think what it is that you enjoy…and make that happen in your Ready Kit. Calling the family? You need to have a re-charger in your bag…buy one that will recharge all your devises and if you tuck in your reader or tablet as you run out the door…you will be able to keep them going with your charger. Your mobile phone is your lifeline to the family…but many times the hospitals…block the cell phone signals. What then? You have to walk all the way to the front of the building and make your calls…not an easy thing to do. I had that happen to me and it was exhausting. So, write down a few of the key family phone numbers to keep posted. You can always ask them to send the information out to others. This way you can use the in-room telephone for local calling. I have my number in the front of my spiral notebook and I’m ready to go. Pets left behind…what about the mail? After a long stay in the ER and then you find out you maybe in the hospital for a day or two longer….have a neighbor or friend that has a key to your home and will take care of your pets. They can also pick up the mail and put it in the kitchen for you and just keep the lights out and everything in order while you are gone. 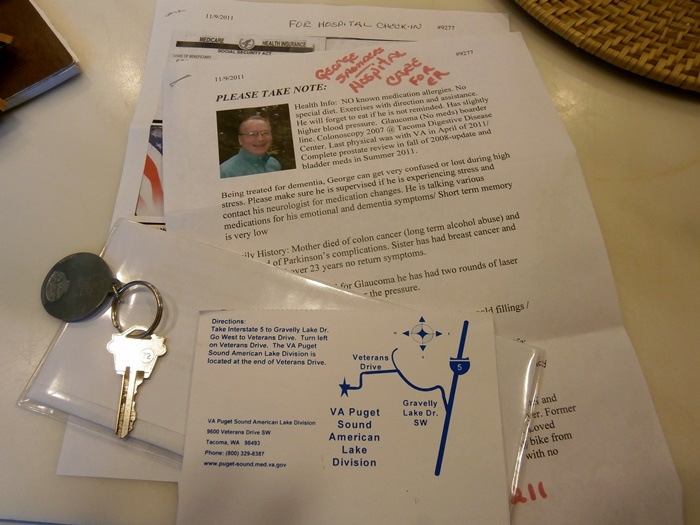 I always put a key ring with my name on it…so the neighbor can keep it and knows who it belongs to — it could be a couple of years before the call could come for them to help….once you have this info in place…you can relax and know that all is well without you leaving your loved one to run home. A Ziplock baggie with little things that mean something to you…to keep you calm. Maybe you need cough drops…or lip balm. A new toothbrush and small toothpaste. Hand cream and face cream…Glasses and a glass cleaning cloth. Maybe you are a person that needs a few peanuts to keep you going or hand wipes to feel clean. If you are in need…you can tuck in a few Poise/Depend pads. Think comfort. NO the bag does not have to be a huge case…its just a big tote…but keep it full of things that bring you comfort…so when you are stressed and worried…you can keep yourself calm. If you forget your tote…then you call a friend to retrieve it from your hall closet and everything is in the tote..instead of the friend wandering around your home for a “few things”. I suppose you read this and think…Oh, I will get on this pretty soon….please do not do that. Go right now and just put a few things in a bag and tuck it in the hall closet. You can make it fancy or expanded later..but get the ER senior’s information kit, in order and a few things in your own Ready Kit–RIGHT NOW. Its like giving yourself a gift…and you will rejoice in it if and when the day comes that an emergency hits your home…and you can just open a door grab your Ready Kit and walk out the door caring for your senior in need. I always want to thank you for caring for your senior. Would you do me a favor and “sign up” up for the blog. That way it will come to you via the email and you will not miss any of the tips…and if you know someone that is a care giver…please share my blog with them…thank you. As a spouse of a Alzheimer’s/Parkinson’s senior…I find the care giving can be so overwhelming and it represents such love. The gift of care is the dearest thing you can give to a person that has become unwell, unsteady or confused. My Georgie has been declining a great deal lately. Falls and safety issues are a daily challenge for me to handle now. I am not blogging as much as I would like…but know I’m here for you to send me a message if you have a question or need help. 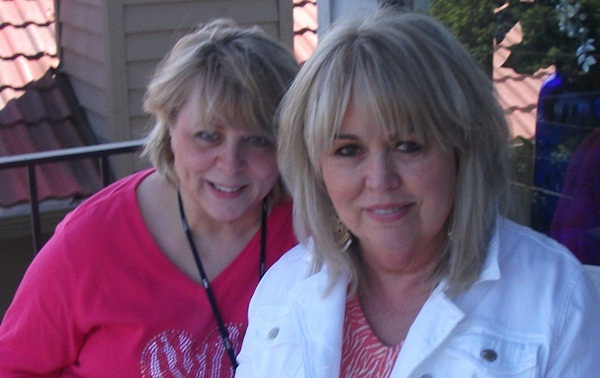 Me with my friend Cheryl who is always helping me with George and supporting me as a loving friend…Thank you Cheryl!